NORTH FREEDOM – Mid-Continent Railway Museum celebrated the reopening of a museum-owned railroad bridge over the Baraboo River on Saturday, July 7th with a “ribbon busting” ceremony. Cheers and applause broke out from the crowd of around 40 dignitaries and guests as the first train to cross the bridge in over a decade burst through the ceremonial ribbon and proceeded into the North Freedom station. The bridge, like most of the Mid-Continent property, was hard-hit by the record flooding of the Baraboo River in June 2008. 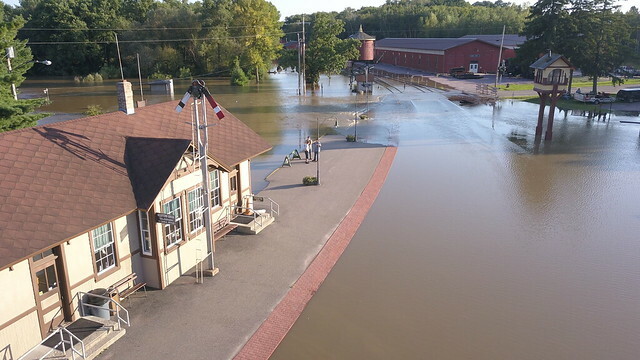 The bridge was almost entirely submerged before the floodwaters subsided. The already 79-year-old bridge remained standing but had become structurally compromised and was no longer safe for trains to cross. It remained that way for the last decade as museum leaders sought ways to fund its repair. In late 2017 all the pieces finally came together. A $600,000 grant was received by the Wagner Foundation, a major supporter of the museum’s ongoing effort to return steam locomotive #1385 to working condition by 2019. The Sauk County Economic Development Committee also approved a grant for $77,000 in economic development funds to cover the rest needed to begin repairs. By January 2018, work crews had arrived and began driving new pilings into the bedrock to give the now 89-year-old bridge a new, sturdy foundation. Contractors completed work on the bridge in late June. The ability to cross the bridge, located adjacent to the museum’s North Freedom depot, provides Mid-Continent greater flexibility for staging its trains. It also restores the museum’s connection to the Wisconsin & Southern Railroad line between Reedsburg and Madison. 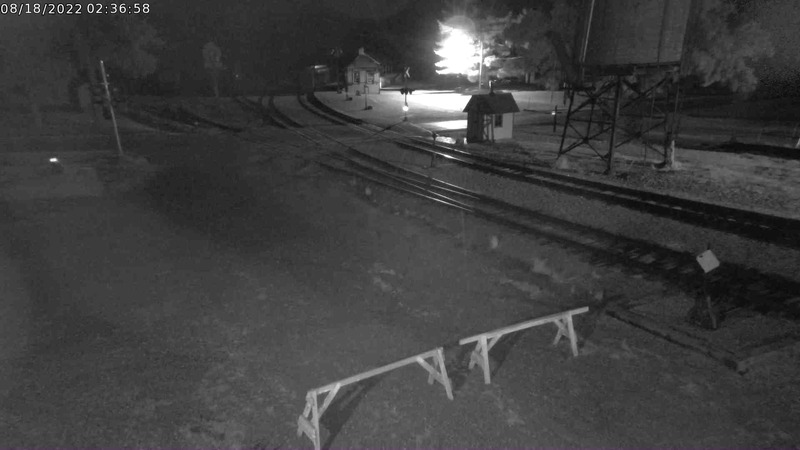 The potential of being able to take the museum’s historic trains beyond the museum’s 3.7-mile North Freedom branchline to other Sauk County communities and Devil’s Lake State Park is an exciting prospect for train lovers and fans of the museum. Ever since being acquired by Mid-Continent Railway Museum in 2006, ex-Army locomotive #1256 has been the workhorse of Mid-Continent’s fleet. [See roster page for full history.] The 60-ton diesel locomotive has pulled nearly 99% of the museum’s passenger trains since 2007. With that much use, maintenance needs have finally caught up with the locomotive. To complete this urgent work and get #1256 back in service, we are initiating a fundraising campaign with a goal of $35,000 and hope you will join us in making this yet another success story. 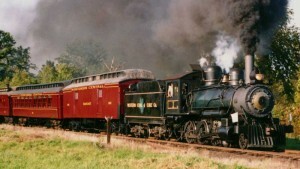 MCRY #1256 pulls nearly all of Mid-Continent’s passenger trains. Seen here near Ulrich Road crossing in 2007. Tim Martin photo. In spring 2018, #1256 was sidelined and locomotive #7 began pulling trains in its absence. #1256 had to be removed from service due to its heavily worn wheels. 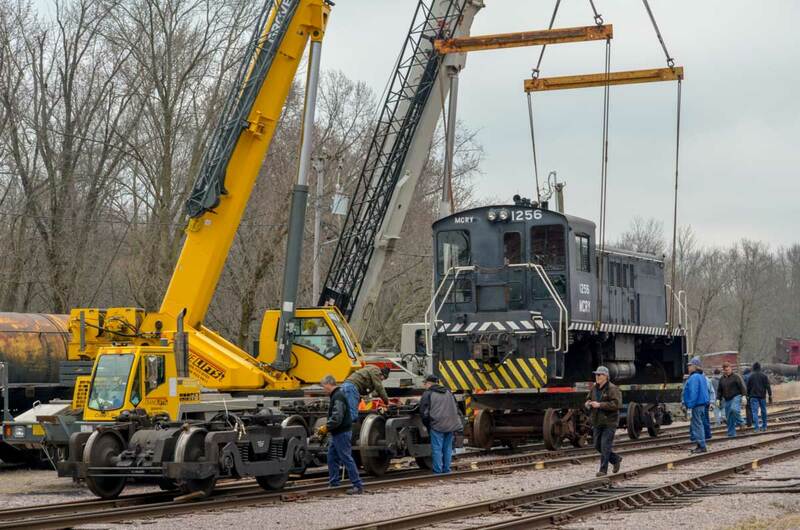 Cranes were brought in to lift the locomotive and remove the wheels so they could be taken to L&S Electric, a railroad equipment rebuilding company in Wisconsin, for disassembly and inspection. Often wheels can be reprofiled using a lathe to extend the life of the wheel – a step akin to rotating tires on an automobile. However, just how tread on a tire eventually wears to the point of needing replacement, the wheels under #1256 can no longer be reprofiled and now must be replaced. Two cranes lift the 60-ton MCRY #1256 to facilitate wheel removal. April 2018. A side-effect of operating historic locomotives and railcars is that often the parts are no longer readily available. That holds true in this case as wheels of the necessary size for #1256 are no longer commercially available. 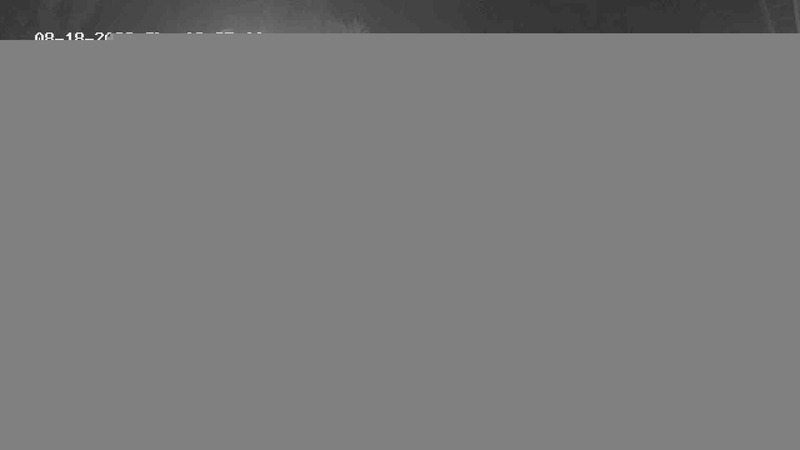 Instead, eight custom-made wheels must be cast. This work is already underway at McKees Rock Foundry in Pennsylvania, the same company that forged custom wheels for Mid-Continent’s steam locomotive #1385 currently under restoration. When the new wheels are done, they will be sent to ORX Rail Services, a company specializing in assembling and rebuilding wheelsets. There the wheels will be machined to final specifications and pressed onto axles before being shipped back to L&S Electric for reassembly. The wheels will then be ready to return to Mid-Continent where two cranes will be used to lift #1256 to allow the new wheels to be rolled into place beneath the locomotive. The cost to cast the new wheels is $26,000. Between previously donated funds and pledges, we have enough to cover this cost. The remaining cost from ORX, L&S Electric, and hiring cranes to install the new wheels under the locomotive is estimated to reach $35,000 and is beyond Mid-Continent’s ability to pay using just train ride ticket sale revenue. For this, we are turning to you for help. Please consider supporting this crucial project. 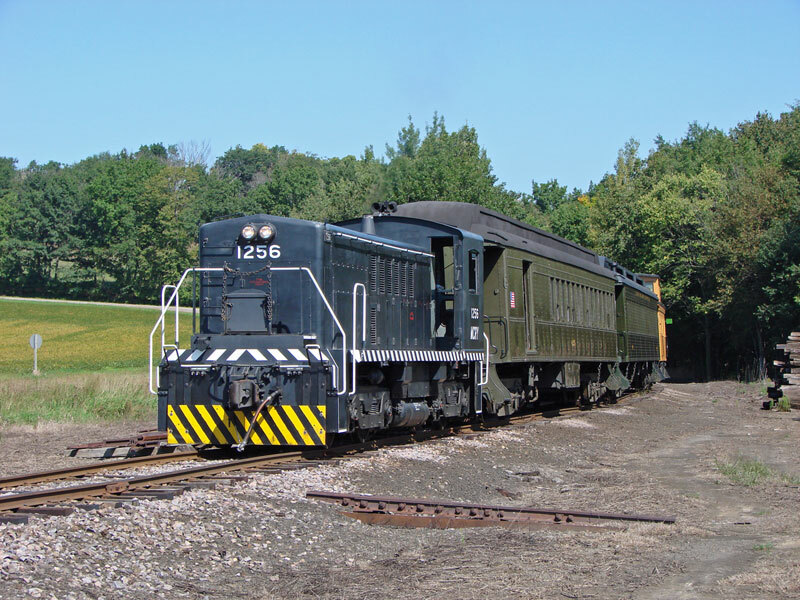 The public image of Mid-Continent revolves around our train rides, but for that to continue we must have a reliable stable of locomotives like #1256 ready to pull those passenger trains. Any gifts, large or small, are greatly appreciated. Donate online securely using Paypal. A Paypal account is not required – also accepts Visa, Mastercard, Discover, and American Express. Credit/debit card donations can be made by phone by calling 608-522-4261 or 800-930-1385 during business hours Monday-Saturday. Mid-Continent is a not-for-profit, educational entity, incorporated in the state of Wisconsin and accredited by the Internal Revenue Service as a 501(c)(3) organization. All donations are 100% tax-deductible. Consult your tax adviser.